Finally I've gotten around to taking pictures of some finished wood projects. I should have gotten out there earlier when the sun wasn't sneaking around the corner. This is the garden that I'd posted about earlier and you can see the trellis and the garden bench in the picture too. 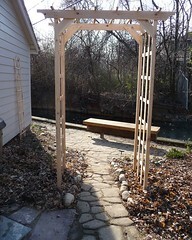 The arbor turned out great! I had it all set up and everything then one night it was really windy and it blew over. The canopy pieces substained the most damage. I had to bring the arbor inside into the hot tub room because it had gotten too cold outside for the glue to dry. A couple days later I took it back outside and set it in better knowing however that I would have to cement it in place very soon. Thanksgiving day was my next opportunity but unfortunately we had another day and.... you guessed it... the darn thing fell over again. Normally I would have completely tramatised by this, but now that I'm taking the Zoloft I just dealt with it. I hated to bring it inside again so I set up a heater and the halogen lights in the garage and did the repairs it needed in there. The glue was setting so it was all good. On thanksgiving day I attached the straps and stakes that I cut from treated wood, dug the holes, leveled it and cemented it in place. I don't think it's going anywhere now unless someone hits it with their car! I still need to get a vine for it and I'm thinking wysteria would be a good choice.